The Eco Office Chair has a contemporary style with lumbar cushions and comfortable seat. 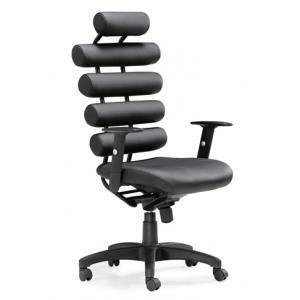 The Eco Office Chair provides great support for lower back and below the waist. It is made with a polyester fiber mesh back and seat. Comes with steel frame, PVC rolling base with an adjustable height with locking tilt and lumbard cushion. It has an integrated head pillow and gas lift. This office chair represents a new design breakthrough in both style and comfort.